Wow! Summer is flying by! I apologize for my “blog lag,” as I have just returned from a trip to Denver for my brother’s wedding reception! I am still catching up, and this short post is just meant to share what we’ve been doing as I catch up from our trip. Though I did some writing, it was nearly impossible to post anything on this trip due to the late hours we kept and the technical issues I continually had with my laptop. I was forced to slow down, but it was worth it for spending quality time with relatives… I will be sharing some pictures soon since they are so much more exciting. We had a great time and got to do some sightseeing: The Cheyenne Mountain Zoo– built into a mountainside, is a beautiful hilly walk, with great experiences for the kids with animals in very natural habitats. The views over the city of Colorado Springs alone are worth the hike. I’ve never seen so many giraffes in one place, and we were there at the right time to see three new baby lion cubs! Coming from the Chicago area, we’ve had many zoo experiences, but I’d have to say this is the best one. I recommend bringing water, as this is all outdoors and they charge a steep price for water bottles. The Denver Aquarium too, is amazing. I really marvel at the design of the exhibits, and the interactive kid friendly atmosphere. Not being a very urban type of person, I felt more comfortable in the more laid back Denver than in Chicago. The way the sea creatures are displayed is a work of art in itself. Everywhere, there is something to look, even above your head! Everything had a natural feel, and drew us in. The Denver Art Museum was very exciting. Every floor had projects that gave kids a chance to create. At the entrance, kids could get one backpack per family and the backpacks contained projects and scavenger hunt activities corresponding a a floor of the museum. Each floor had a little reading room/ play area decorated with different types of art corresponding to the theme of that floor. It gave us a chance to relax and read the art books, and let the children play. I really admired the variety of exhibits in the museum, the interior design meant to feel homey, and the activities to keep children busy and let them learn. Restaurants: We had dinner at the Irish Snug on Colfax Street and heard Irish singer Brian Clancy, who is there almost every Saturday. Luckily we had a baby sitter that night, as a we celebrated with my bro and his wife, to the tune of good old Irish drinking, fighting and love songs amidst the chorus of audience participants. Brian Clancy is a great singer, and a lively local legend. Another fun, eclectic place we tried was Buenos Aires Pizzeria on 1319 22nd St, Denver 80205. Surprisingly great pizza and Italian food, sandwiches and Argentinian food with many choices. The bread and pesto sauce were amazing! And real, freshly made gelato ice cream for desert! I know what you’re thinking– Where are the kids? Next time! Some things take a little planning, and maybe parents want to go up first to assess the flight for their kids. Found out hot air balloon pilots do take children on board. 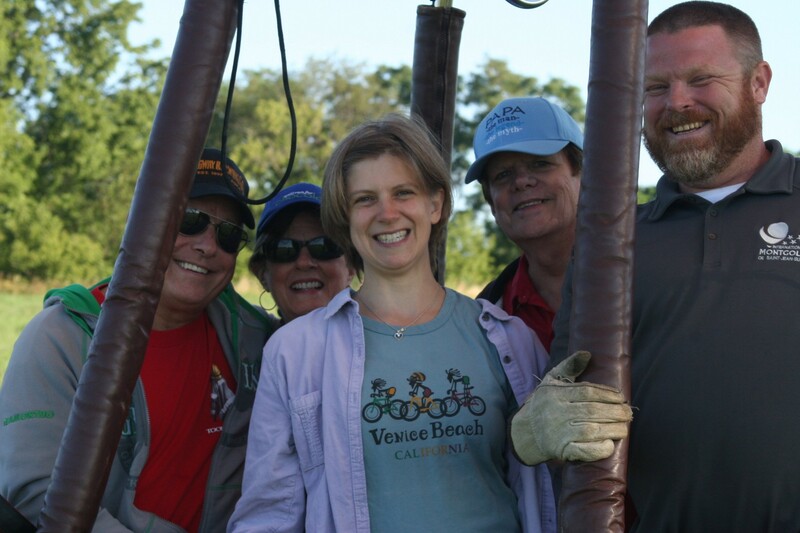 Nostalgia Ballooning is the only balloon company in the Chicago area. According to Nostalgia Ballooning in Hampshire, Illinois, children under five squirm too much, but provided there is parental help, children above five are generally able to see out of the basket and follow directions– which is all that is necessary for them to be involved in this lovely adventure! So when our son turns five, then he and his sister might go with us! We arrived at 5:30 a.m. (You can see the moon still out when we were up in the air in the picture above.) Morning is when the winds are most still. Evenings are the second best time. The crew helped the pilots spread out the balloons on the ground and hold them while they were filled with cool air. You can see the size of the balloon in my new header picture where it is still being filled behind the truck. Once the balloons were full, the pilots started blasting the propane and a little hot air made the balloons start to pull away. We climbed into the basket, which felt like an over sized picnic basket. Five adults fit comfortably, considering everyone had a beautiful panoramic view. If you like watching out a plane window as you ascend, think of how it would be to feel embraced by the sky and fresh air from a basket! Planes hit turbulence in the clouds as they ascend more than 4,000 feet. Hot air balloons stay below that airspace. It is still possible to distinguish houses and trees. 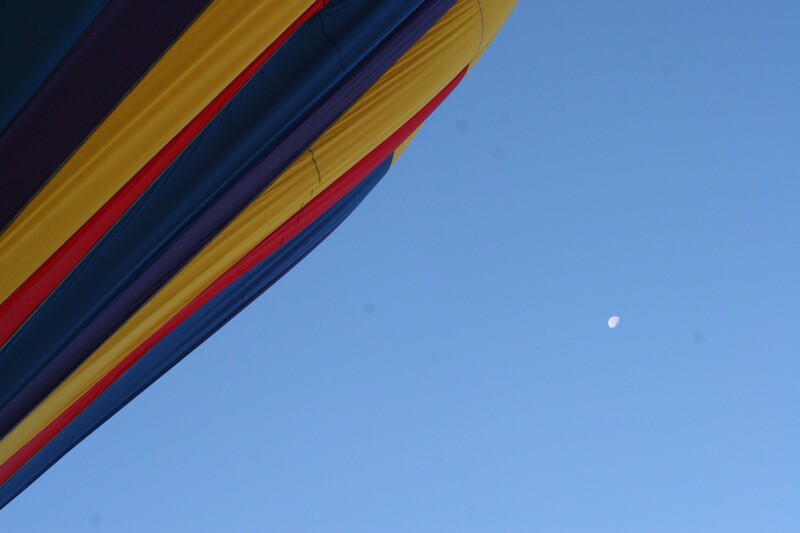 The balloon lifted off gently and moved at only about eight miles an hour upward. We reached 3,828 feet high, and could glimpse Lake Michigan and Chicago on the horizon, with the sun shining almost right out of it, meaning we were due West of Chicago. We traveled 8.02 miles and the trip lasted 1.07 hours. About half way through the trip we came to a lower altitude. We crossed over familiar roads, the I 90 expressway, and drifted East. 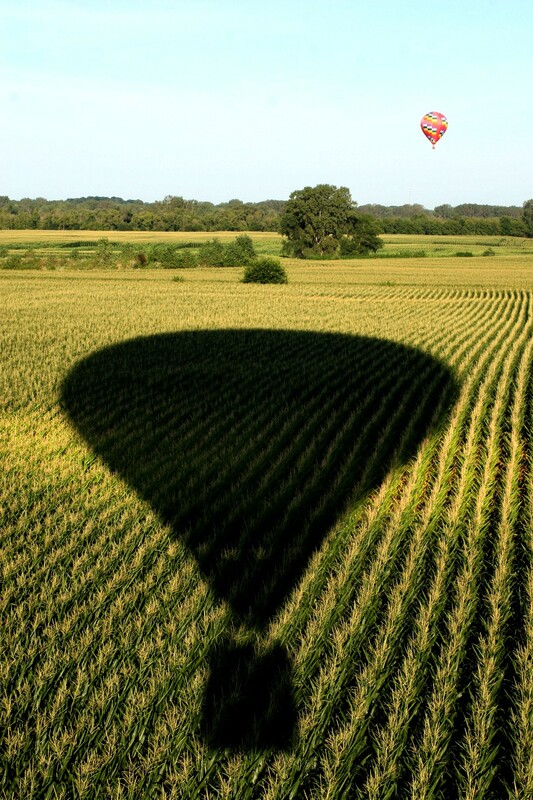 There is no control over the destination– but the countryside is full of decent landing spaces. Since the fuel lasts only a little over an hour, the pilot begins scanning for good spots well before then. We touched some tree tops as we flew over! When the pilot found a good spot, we landed, but waited for the ground crew to get permission from the property owner. Permission granted; the ride was over but the excitement lasted. The entire crew helped push the air out of the balloon and it was crazy to see such a glorious and gigantic item stuffed into a seemingly small, plain bag! I want to look into this National Balloon Museum more. Have any readers been there? Let me know about your experiences with hot air balloons! Another opportunity I’ve been looking into and planning for is the Young Eagles Program. Kids over eight years old can ride for free with a pilot as an introductory flight. This happens at airports all over the country. Check for events in your area. Lake in the Hills, Illinois, and the Dekalb-Sycamore Airport of Illinois sponsor a Young Eagles Flight event every year.